Whoever says the Michigan-Michigan State hoops rivalry is nonexistent is clueless. All one has to do is watch the teams' defensive prowess on the court. Take last night's knock-down, drag-out brawl between the green-clad Spartans and maize-draped Wolverines at the Crisler Center for instance. The 60-59 Michigan victory, sealed when MSU's Draymond Green missed a runner in the lane in the closing seconds, sent the Maize Rage and Wolverine faithful into euphoria. For Spartan fans, it hurt more than a traditional loss. The Wolverines dominated the game for the first 30 minutes. It's true Michigan State pulled to within one with about three minutes to play in the first half, but the game never felt close. The closing quarter of the game was different. Right after Michigan built its largest lead of the game (47-36), the Spartans went on a 14-2 run to take their first lead on the night. From that point, it was nip and tuck until the end when questionable clock management by Tom Izzo, extraordinary defense by Michigan, and Green's off-target floater allowed the Wolverines to protect home court and, in the process, defeat the Spartans for the third-straight game. That hasn't happened since 1998 during Michigan's Tractor Taylor days. Defensively, both teams struggled at times. The difference was when Michigan State got a basket to fall, it seemed to really have to work for it. Michigan was able to capitalize on "turnovers for touchdowns" as Izzo calls them. Those breakaway layups negated MSU's half-court defensive strength. As the below defensive project score sheet will show, no individual who logged significant minutes (sorry, Black McLimans. Your one basket allowed in two minutes doesn't count.) had a worse defensive evening than MSU's Adrian Payne. It was the second-straight game Payne lacked energy and seemed to be a bit slow. Against the Wolverines, the only "stop" he recorded was when a player he fouled - Trey Burke - missed his And1 free throw. Travis Trice, as noted many times during the telecast, seemed lost on the defensive end. He couldn't keep up with Michigan's Burke and was a defensive liability all night. It was such a bad night the hashtag #medialovestrice was MIA. 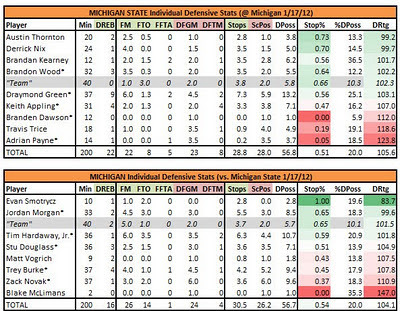 Even Green and Keith Appling had below-average games for the Spartans. Collectively, Michigan played solid team defense. Jordan Morgan played exceptionally well in the post for the Wolverines, causing three turnovers. For a big, that's pretty significant. Tim Hardaway Jr., also played a real solid game for the Wolverines, taking a pair of second-half charges and forcing 3.5 turnovers on the evening. One player who is getting some love for his "big plays" last night is Zack Novak. Conversely, Novak overall was pretty lousy on defense. I respect the Novaks of the world. Novak doesn't have much talent but the guy works extremely hard. It also helps that Novak is an above-average 3-point shooter, fitting perfectly into Michigan's offense. That said, for all the great plays Novak seems to make, he allows players to score more than most will suggest. Last night's game was a perfect example. That perception could be because, as the ESPN telecast mentioned, "Novak plays great help-side defense." I would argue that, 90 percent of the time, all Novak does is play help-side defense. Whenever the ball enters the post, Novak is there like a stalker, positioning himself for a faux double team. Once teams recognize this - as MSU did late in the second half - a kick out to Novak's man results in a fairly open shot. No player in last night's game allowed more field goals than Novak. The numbers don't lie. 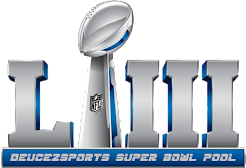 Luckily for Novak, he could have allowed one more field goal. He was responsible for Green in the closing seconds. He stayed with green at the 3-point line but, once Green started toward the hoop, Novak peeled back. If Green makes that shot, the Spartans likely win and Novak's defense on the play becomes a major talking point. 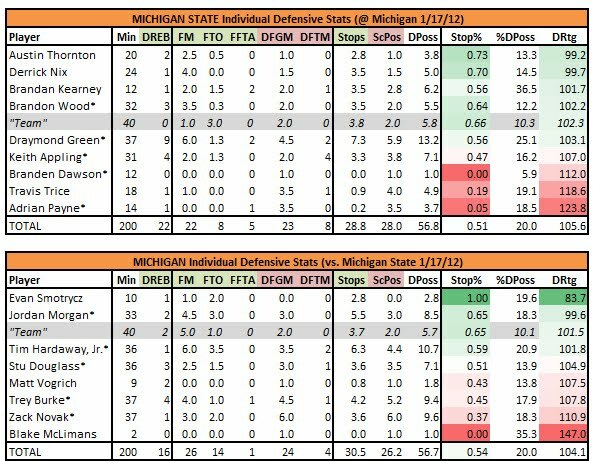 But, Green missed (credited as a team miss because while Novak was responsible, he didn't defend the actual shot and no Michigan player stepped up leaving Green with a pretty much uncontested floater) and Novak and the Wolverines are "state champs" on the hardwood for the third-straight game.